Portable illumination system for high-speed & ultra high-speed imaging. Ultra Bright & Ready for Action. Light it up with high-Intensity, high performance LED modules & controllers designed for high-speed & ultra high-speed imaging from Visual Instrumentation Corporation. High-speed and ultra high-speed digital cameras require extremely high light levels for microsecond and nanosecond shutter speeds to capture the action. The VIC Single Ultra-Bright LED lighting module paired with VIC Video Strobe & Flood Controllers answers the call. 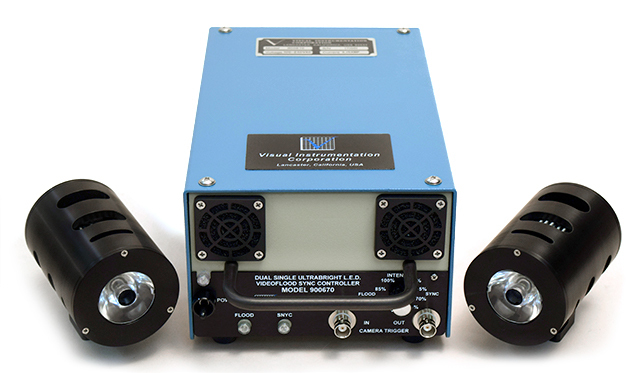 This portable, high performance lighting system is designed to meet the demanding needs of US military field & flight testing, R&D laboratory testing, and DIC (digital image correlation). Ultra-Bright lighting modules are precision engineered with a 17˚ FWHM lens indexed to the LED, ensuring precise optical alignment. The LED is color correlated to 6,500 °K with a luminosity of 100 lumens per watt. Single or dual modules are powered by a variety of companion video strobe and/or flood controllers with variable luminous output to accommodate modeling light for camera set-up and exposure. Controllers include input/output triggers which can be used to connect and coordinate events for consistent image acquisition for all your high-speed imaging needs. 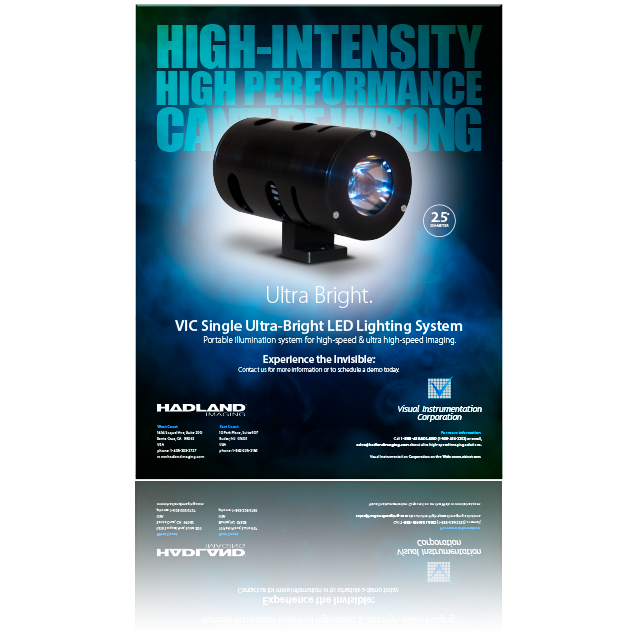 Press the button already or call 1-888-43HADLAND (1-888-434-2352) to get your VIC Ultra-Bright LED Lighting System (or at least find out more information).